Sleaford Town made club history on Saturday, reaching the last 32 of the FA Vase for the first time with their third win of the season over the Cuckoos. The nearest to a first half goal was Dan Cotton’s free kick against the crossbar for Yaxley. The Cuckoos did go ahead with a 69th minute Jon Stead strike. Yaxley’s prospects were hit by the dismissal of sub Wayne Morris for a second caution, but they had a chance to seal victory when awarded a penalty which the reigning Peterborough Telegraph Player-of-the-Year Cotton fired against the foot of the post. The Cuckoos were left to rue that miss when Jac Wright equalised in the second added minute. 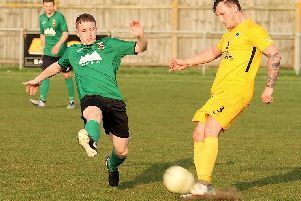 The Greens, who had already beaten Yaxley twice in the United Counties League Premier Division this season, made their extra man count by scoring three times in extra-time to coast into a 4-1 lead. David Hone headed Sleaford in front after 99 minutes. A cracking strike from Ryan Oliver made it three on 111 minutes and then Harrison Allen forced an error which enabled George Asplin to extend the Greens’ advantage to three after 113 minutes. Yaxley’s 10 men kept going with Cotton scoring after 119 minutes. Sam Spencer reduced the arrears further three minutes later but Sleaford held on to make history.